Homegrown political parties in Myanmar’s ethnic areas have been merging together in the hope of winning a majority of seats in both national and regional parliaments in the upcoming 2020 general elections, a victory that would grant them more authority to improve their rights. Get Ride, a local community-based ride hailing platform, has officially launched in Mandalay, Myanmar. Bangkok Airways has removed from its flight schedule the Phuket-Yangon direct flights that were to launch in November as the route has yet to be confirmed, Bangkok Airways staff told The Phuket News today. Mandalay Yoma Energy on September 11 installed a solar rooftop for Damco Wood Products’ factory in Yangon. Over 98 per cent of construction work for the locomotive factory building has finished and will be complete at the end of December. State Counsellor Daw Aung San Suu Kyi will fly to Vietnam on Tuesday for a three-day visit at the invitation of Vietnam Prime Minister Nguyen Xuan Phuc, a senior Foreign Affairs Ministry Official said. Police in Bangkok shut down a forum organised by foreign journalists to discuss whether senior military officers in Myanmar should face justice for alleged human rights abuses committed by their forces against Rohingya Muslims and other ethnic minorities. A total of 17 out of the 26 Myanmar SOEs under the Union budget are expected to turn a profit in 2018-19, commencing October 1, according to the Ministry of Planning and Finance (MOPF). This year’s event was hosted by Myanmar, and present on the occasion were Deputy Minister for Transport and Communications Tha Oo, departmental heads and local and foreign guests from the maritime field. Yuttaphum Simpalipun used to feast on her grandmother’s traditional Thai food when he was a kid. He would watch her whip up recipes to perfection in the kitchen of their ancestral home and at times he would volunteer to help preparing the dishes. 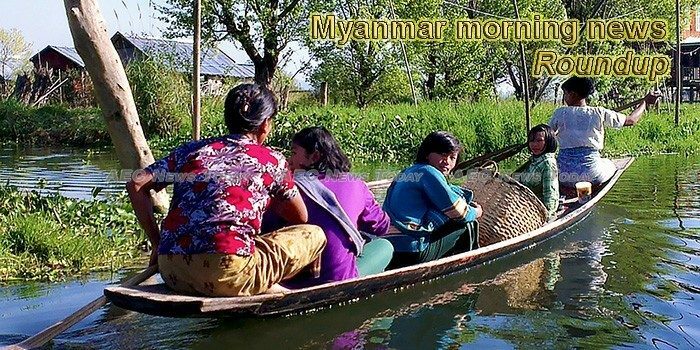 The Myanmar National Portal will be launched in the English and Myanmar languages to provide information about the country and government in a single place, according to the Ministry of Transport and Communications. Nai Hong Sar, the vice chairman of the New Mon State Party (NMSP), recently spoke with The Irrawaddy’s Nyein Nyein about the stalled peace process. Sittwe Township court passed an order to charge former Chairman of Rakhine National Party (RNP) Dr. Aye Maung and writer Wai Hin Aung with two counts including high treason on September 10. Some villages in Putao Township, northern Kachin State have been affected by flooding caused by the overflowing of the mountain stream as a result of heavy rain since Sunday (September 9). Visitors will no longer need to fill in the Arrival and Departure cards at the Yangon, Mandalay, and Naypyitaw international airports. The solo walker, Ko Soe Wai, arrived in Loikaw while wearing a T-shirt with the slogan “Peace in Myanmar” and holding the Myanmar flag. A Myanmar court’s decision to jail two Reuters journalists for seven years a week ago represented a near-fatal hammer-blow to the country’s fragile press freedom, and gravely undermines the credibility of Myanmar’s democratisation. Myanmar, facing international outrage over the jailing of Reuters journalists for their reporting on a massacre of Rohingya Muslims, is conducting a “political campaign” against independent journalism, the UN said today. Myanmar’s health department has launched an investigation after a man from Ayeyawady Region complained of having a six-inch surgical instrument left in his abdomen following a surgery 26 years ago, causing him decades of severe pain. The UN rights chief called Monday for the creation of a new “mechanism” tasked with preparing criminal indictments over atrocities committed in Myanmar, amid allegations of genocide against the Rohingya minority. Oxfam, an international agency, today called for 15 per cent of new funding to be set aside for humanitarian programmes designed to provide better support to Rohingya women and girls, including $72 million of the nearly half a billion dollars recently committed by the World Bank. On September 14, the accused pair will be scrutinized in the trial. Bangladesh on Tuesday urged the international community to put more pressure on Myanmar to provide a permanent solution to the Rohingya refugee crisis and ensure their safe return. The CAEXPO’s appeal and stature is growing year on year. As much as 40 per cent of the participating Chinese vendors are repeat exhibitors, with this year’s fair attracting several new exhibitors. Eight ASEAN member countries – Cambodia, Indonesia, Lao PDR, Malaysia, Myanmar, the Philippines, Thailand and Vietnam – notably have chartered independent halls to showcase their own products and services.